Cooking lettuce doesn’t exactly come naturally. Sometimes I see chefs on TV cooking little gem lettuce with peas in the French style − Petits Pois á la Française − and it all looks so lovely, but at the back of my mind I just know that if I did it the lettuce would taste like old socks. Roasting makes a bit more sense because it’s more about caramelization rather than actually cooking the lettuce through. With that in mind, I thought I’d give this recipe a go. Bon Appetit took the flavors of a classic chicken caesar salad and rejiggered it into this beauty of a meal. Garlicky breadcrumbs sat on top moist chicken with slightly charred hearts of romaine lovingly embraced by an anchovy-fuelled dressing that packs a serious flavor punch. It’s not often that I take matters into my own hands and mess around with recipes, especially those from the likes of Bon Appetit, but as I write this I’m realizing that in this case I did actually make quite a few adaptations. I’m a fan of anchovies. I think they can add great depth of flavor and most of the time you can’t detect even the slightest hint of fishiness, but not everyone would be thrilled to be served a roasted piece of lettuce with a tiny fish draped over it. So I decided to blend anchovies, oil, lemon juice and garlic into a creamy dressing, then I chucked in some capers and brushed the dressing onto the lettuce before roasting. Without doing this, I think the lettuce might be a little flavorless − lemon juice can only do so much. 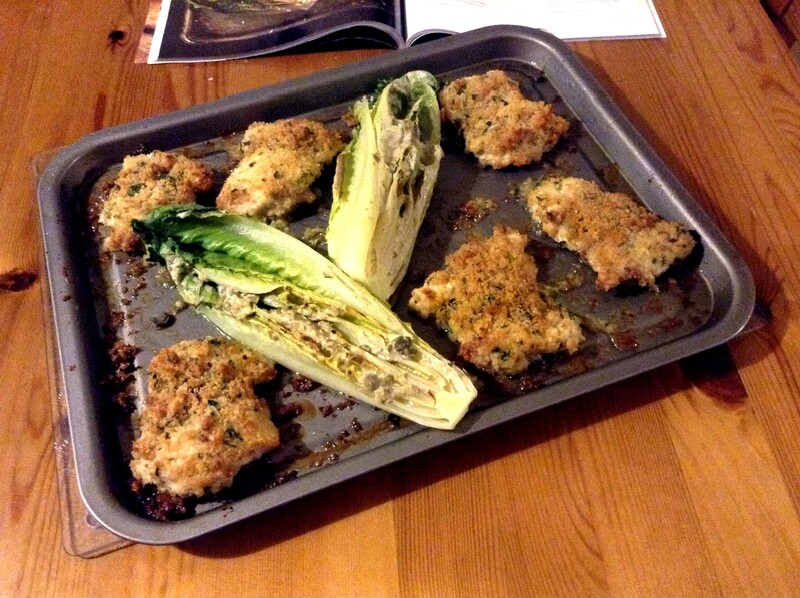 To add in another element of a classic caesar dressing, I used Dijon mustard to adhere the breadcrumbs to the chicken. The original recipe doesn’t use anything to make the breadcrumbs stick, but why not take the opportunity to enhance the flavor even more? I also used thighs rather than breast because they taste better, they stay moister and they’re much better value for money. This dinner was a huge success and I’ve been dreaming about roasted lettuce ever since. Maybe this spring I might even try my hand at Petits Pois á la Française. But in the meantime, face your fears of cooked lettuce and try this out. It’ll leaf you speechless! 1. Preheat oven to 450ºF (220ºC). 2. Season chicken on both sides with salt and pepper and place on baking sheet. 3. Combine cheese, breadcrumbs, parsley, one garlic clove and 2 Tbsp olive oil in a medium bowl and season with salt and pepper. 4. 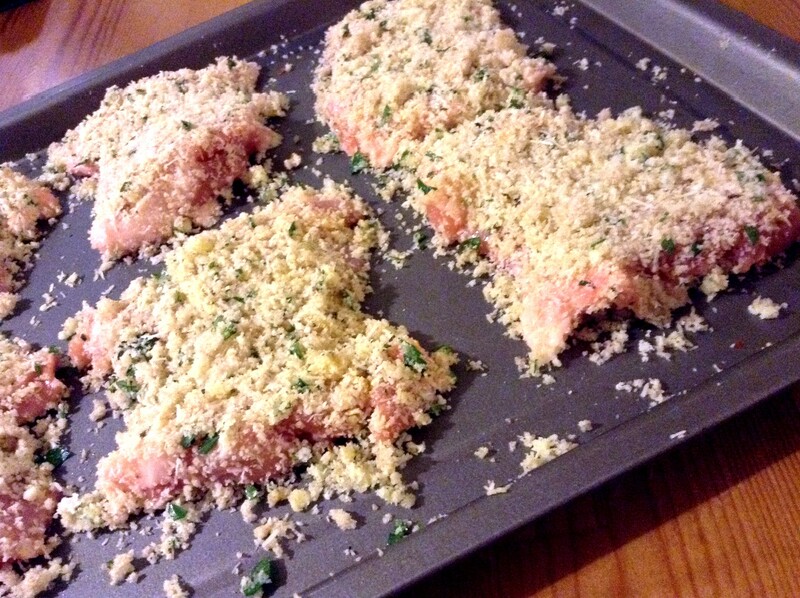 Brush chicken thighs with Dijon mustard and pat a large handful of the breadcrumb mixture on top of each thigh. 5. Roast thighs in the oven until the tops begin to brown, about 10 minutes. 6. In the meantime, using a food processor or hand blender, blend anchovies, remaining 1 Tbsp of olive oil and lemon juice into a dressing. Add capers and stir to combine. 7. Place lettuce around chicken on the baking sheet or on a separate baking sheet if you want and brush liberally with dressing. 8. Place chicken and lettuce back in the oven and cook until chicken is cooked through and lettuce is browning around the edges, about 5 minutes but watch carefully to stop the lettuce from burning. 9. Serve with extra wedges of lemon to squeeze over. my mouth is watering just thinking of all those flavors! It’d be even better with Californian lettuce! Grilled lettuce is always so much better than it sounds. Nice dish! I know that grilling romaine is popular but I haven’t done it. 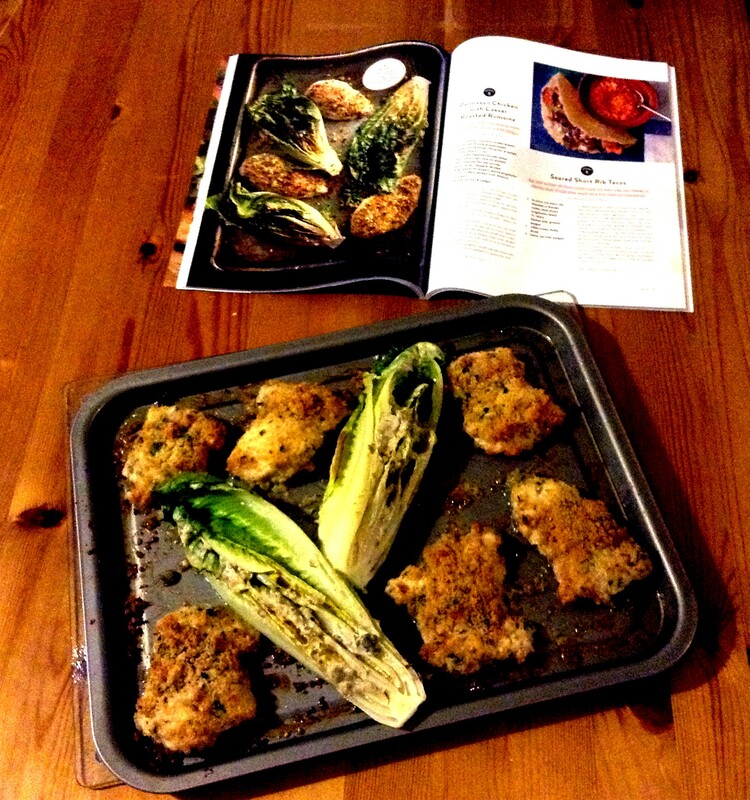 Looking at your dish, which looks better than in the magazine, you’ve convinced me to prepare your adapted recipe. Thanks, Karen! I think if you make the dressing and brush it onto the romaine before grilling, the lettuce just has so much flavor. Plus, I love capers!